Here's an excerpt from chapter 6 (What Your Coach Wants) of my new book, The Young Athlete's Guide to Playing Sports. This topic discusses how coaches often hold different views on how a sport should be played and what you can do to accordingly improve your opportunity to play. Coaches possess their own unique perspectives on how their sport should be played and the associated skills and values they need to teach. One coach may prefer a man-to-man defense while another one is convinced that a zone defense is best. But besides different views on strategy and game tactics, your coaches may also hold entirely different philosophical views on what constitutes success and how to achieve it. You need to understand the type of coach you play for. If you’re playing for a hard-nosed, demanding coach, you will have to put in the necessary extra time expected of you. If your coach is intense, display a similar attitude (as opposed to one that is more laid-back). Pay close attention to what parts of the game your coach emphasizes and concentrate on improving your play in those areas. To one extreme, your coach may view success largely as a matter of winning versus losing. This type of coach will believe that players should dedicate themselves to the team, work hard, and sacrifice to reach the primary goal of winning as many games as possible. Your coach will likely invest a great amount of time into the program and expect you to do the same. You’re more likely to play for this type of coach as you climb the competitive ladder. Toward the other end of the spectrum is the coach who believes that players should have fun, enjoy the game, while also learning skills and possibly life lessons. This coach may or may not invest a large amount of effort in his program. He or she is less concerned about you winning and more so about you playing to the best of your ability, and striving to improve. 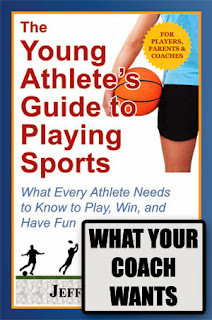 You are more likely to play for this type of coach in youth programs when you’re younger. Focus on your coach’s perception of what’s important, not your own! Typically you will have little control over who is your coach—especially if you’re an average athlete playing at the more competitive levels. You may prefer a prior coach’s style or approach, but this is irrelevant to your current situation. Coaches sometimes adapt their coaching style to better match a player‘s particular personality type and attitude—but you shouldn't expect this to happen. Unless you demonstrate some unique talent, it’s unlikely you will be chosen over someone who more closely fits your coach’s model player. If you want to maximize your opportunity to play, you need to adapt your preparation and play to match your coach’s perspective and needs. His perception of you may be very different from your own. For example, you may think that you’re an asset to your team when the ball is in your hands and you’re aggressively trying to score. But your coach may instead see you as a liability—a selfish player who won’t pass the ball to an open teammate.